The Asian Citizens Assembly (ACA) 2010 concluded recently in the South Indian city of Bengaluru and succeeded in bringing together citizens from across Asia to share and discuss the challenges, hopes and aspirations of the people inhabiting the largest landmass on the face of the Planet. The ACA was themed on the 5 Es of Ethics, Equity, Economy, Education and Ecology and included workshops on these to spell out the contemporary status of these indicators and the need for action for peace and sustainable development in the region. Citizens’ Assemblies gather women and men, association and organizations that would want to participate in renewing democracy and act in significant changes in their society and at global level. The Assemblies are not a kind of new parliaments or new institutions. The citizens’ assemblies are a result of challenges and mutations of the 21st Century: globalization, intensity of inter-dependencies from domestic level to a global one, a multiform crisis of the democracy, development and production models which have become predators and non-sustainable. The rise of Asia in the 21st century with the booming economic growth of the two giants, China and India in addition to the economic growth of Japan, and military modernization of South Korea among other developments is only one side of the coin. The other side of the coin is alarming and the challenges of a scale never experienced before. Today, lasting peace remains elusive as armed conflicts based on religion, nationalism, ethnicity, land and natural resources wage ceaselessly across the continent, killing thousands and capturing millions more in the tentacles of poverty and hunger in the process. Illiteracy and lack of quality education throughout Asia is undermining the ability of people to avail gainful employment, and from achieving a satisfactorily good standard of living. Lack of access to basic services is causing immense suffering, especially amongst marginalized populations and poor people, while ineffective, disorganized and non participatory governance and political institutions are further impeding development. Environmental degradation is reaching epic proportions, with pollution and emissions of greenhouse gases constantly on the rise, deforestation occurring faster than ever before, and natural resources being plundered relentlessly. With participation from countries stretching the length and breadth of Asia including Iran, Jordan, Afghanistan, China, Nepal, India, Sri Lanka, Indonesia, Malaysia, South Korea and Japan to name a few and led by the Global Citizens for Sustainable Development, the ACA 2010 was more of an experiment set in space and time. Organized in collaboration with Delhi Greens, the assembly also marked the International Year of Youth by beginning the ACA with a two days Asian Youth Assembly. 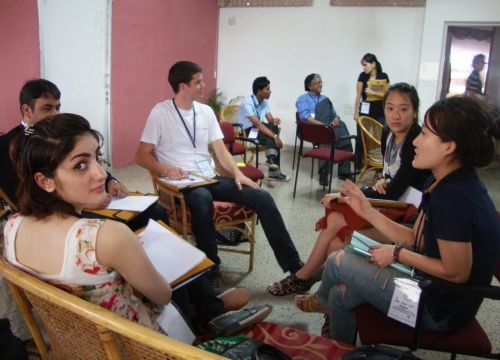 The Asian Youth Assembly encouraged young people to dedicate themselves to fostering progress, including the attainment of the UN Millennium Development Goals (MDGs), which seek to slash a host of social ills, ranging from extreme poverty and hunger to maternal and infant mortality to lack of access to education and health care, all by 2015. Throughout the ACA, a parallel Silk Route Art and Culture Festival hosted a range of manifestations in culture and art related both to the quickly advancing modernity and the firmly rooted cultural traditions of Asia. The festival was an attempt to create a forum where cultures, religions and ideas meet with the overarching theme of Peace, and acted as a meeting place for interesting artists and arts management experts and also as a platform for participants to dialogue using the medium of art and culture during the Assembly. The participating delegates took back a better understanding of cultures and cultural affinities of Asia and a network of committed youth and adults all of whom having the will to act.